В 1932 году Уолтер Бич вместе со своей женой Олив создали компанию "Beech Aircraft Corporation". В конце 1950 года, когда Бич умер, главой стала Олив Бич. сохранив этот пост до начала 1990-х. Причем в 1980 году компания была поглощена компанией "Raytheon". Ключом ДальшеMore>>> к быстрому успеху компании стало создание самолета Beech Model 17. Хотя его ранняя модификация Model 17R. построенная всего в двух экземплярах, обладая превосходными летными характеристиками, более подходила для опытных пилотов, нежели для широкой продажи, на которую рассчитывали. Самолет Model 17R, поднявшийся в воздух в ноябре 1932 года, продемонстрировал отличный диапазон скоростей от 97 до 322 км/ч. Самой примечательной деталью его конструкции был вынос назад бипланной коробки и расположение крыльев со смещением. Такая компоновка была выбрана с целью обеспечения пилоту лучшего обзора и для целостности конструкции, а кроме того, как показали испытания в аэродинамической трубе, обеспечило лучшее сочетание скорости и устойчивости. Каркас фюзеляжа в основном был сварен из стальных труб и нес полотняную обшивку. Узкоколейное заднее шасси было необычно - основные стойки были закрыты большими обтекателями, а колеса могли убираться в полете, полностью уходя под обтекатели. Закрытая кабина вмещала одного пилота и 3-4 пассажира, капот туннельного типа укрывал звездообразный двигатель Wright R-975-E2 Whirlwind мощностью 420 л.с. Превосходные летные характеристики самолета Staggerwing, ставшие причиной роста его популярности, обусловили заинтересованность компании в улучшении управляемости машины, особенно на земле, что привело к ряду усовершенствований, включая установку основных стоек шасси с более широкой колеей. Но решающим шагом в расширении рынка сбыта самолета стало появление модификации Model B 17L, поднявшейся в воздух в конце февраля 1934 года. Этот самолет имел новое, еще ниже расположенное, крыло с увеличенной кривизной профиля и с большим внутренним пространством для размещения убранного шасси. В сочетании с менее мощным звездообразным двигателем Jacobs 1-4 (225 л. с.) это дало лучшую управляемость при сохранении диапазона скоростей от 72 до 282 км/ч. А оснастив Model 17 более мощным Jacobs L-5 (285 л.с), "Beech" стала одной из крупных самолетостроительных компаний. С тех пор построено множество самолетов Staggerwing для гражданских и военных целей, с постоянно растущим числом модификаций с различными двигателями. Гражданские модификации: Model В17, Model C17, Model D17, Model E17 и Model F17, появившиеся перед Второй мировой войной, а также улучшенный Model G17S, построенный в 20 экземплярах в первые послевоенные годы. Когда в 1939 году Авиационному корпусу Армии США потребовался небольшой самолет связи, он приобрел три самолета Model D17 для оценочных испытаний (под обозначением YC-43), но заказ на 27 самолетов был размещен только в 1941-1942 финансовом году. Всего было заказано 207 самолетов Beech 17 под обозначением UC-43 с силовой установкой из одного двигателя Pratt & Whitney R-985-AN-1 мощностью 450 л.с. После вступления США во Вторую мировую были затребованы для военной службы 118 гражданских самолетов Model 17, включая Model D17R, D17S, F17D, E17B, C17R, D17A, C17B, B17R, C17L и D17W под обозначениями UC-43A, UC-43B, UC-43C, UC-43D, UC-43E, UC-43F, UC-43G, UC-43H, UC-43J и UC-43K соответственно. 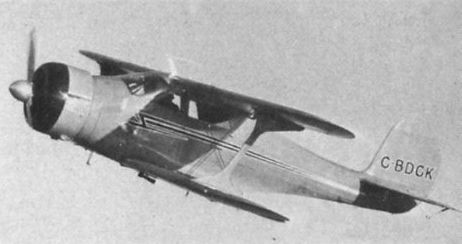 ВМС США затребовали один Staggerwing в начале 1939 года - это была гражданская модификация Model C17R, обозначенная JB-1. Обозначение GB-1 было дано еще 10 самолетам, аналогам гражданского Model D17, заказанным в 1939 году, и позже - еще восьми "мобилизованным" Model D17. В целом военные закупки составили 342 самолета GB-2, 105 из них переданы по ленд-лизу Великобритании, где все самолеты использовались преимущественно ВМС под обозначением Traveller (это обзначение приняли и в ВМС США). THE design of high-speed single-engined aircraft in the United States has become stereotyped. 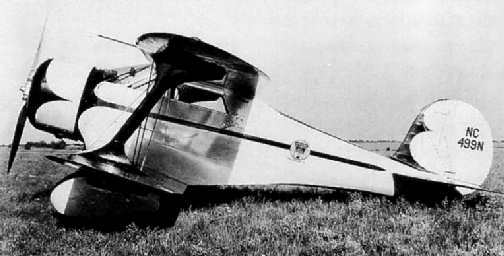 Low cantilever wings, monocoque fuselages, retractable or cantilever undercarriages and radial engines with low drag cowling are prevalent. The design of the "Beechcraft" is refreshing, and apparently the machine loses nothing in the way of performance over the more conventional types. It can maintain a cruising speed of 170-180 m.p.h. for from 300 to 1,000 miles. To make this long rang practicable great comfort is necessary. The cabin is roomy; a large man may stretch his legs as far as he wishes, and has ample elbow and shoulder room. As the result of thorough sound proofing, conversation is easy. Either hot or cold air may be admitted to the cabin without opening the windows. In order that the front seats may be large and roomy and still be accessible, the right-hand seat is on slides and may be pushed back out of the way when passengers are entering the front seats. One objection against high-speed flying often made by passengers is that when flying through rough air the feeling is much the same as that when riding in a high-speed motor-boat on rough water. As a result of experiments, a new type of passenger seat has been developed for the "Beechcraft." The two individual rear seats are suspended in such a manner that they float on rubber and their movement is controlled by a double-acting hydraulic shock absorber which eliminates all jarring experienced while flying at high speed in rough air. Another problem to be contended with in the design of high-speed aircraft is that of vision. 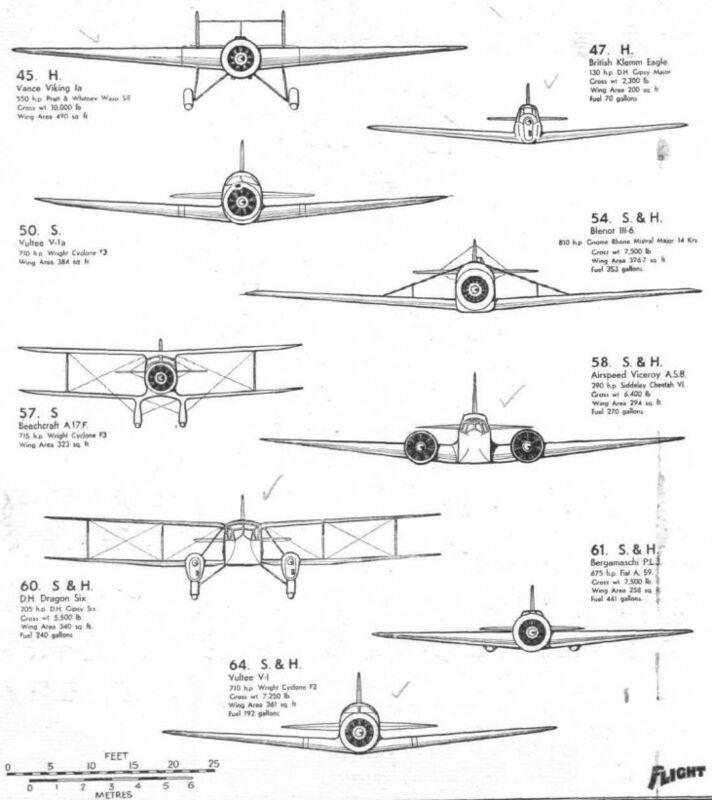 In many of the conventional low-wing monoplanes downward vision is distinctly poor. The negative stagger on the "Beechcraft" makes it possible to seat the pilots so that they may see back over the top wing while turning and have an excellent view downwards. In bad weather the windows beside the pilots may be lowered for better vision, but the slope of the wind shield is such that rain drops will not collect and the air flow is so straight and fast that rain is literally wiped off. Vision for landing or taxying is excellent, for when sitting in the front seats it is possible to see the ground directly ahead of the machine by looking down beside the engine instead of over it. The pilot's comfort has been very seriously studied. All instruments on the dashboard are literally at his finger-tip. The adjustable tail plane is electrically operated, and it is not necessary for the pilot to reach behind his head, under his seat or to pump, turn or pull anything while he is flying the machine. He merely touches a knob close by the throttle and an electric motor does the rest. The controls are well co-ordinated and all hinges, pulleys and push-pull tubes have double-seal ball bearings. The wing loading is lower than that of conventional aircraft possessing similar performance characteristics. Differentially operated ailerons of high aspect ratio run the full length of the lower wings. The mechanism gives an upward travel of 45 deg. and a downward travel of 15 deg. This, together with the Frise balances, eliminates any tendency to yaw into a turn when the ailerons are used to bring the wing up at high angles of attack. There is no definite stalling point, for beyond the angle at which a normal aircraft would stall the "Beechcraft" stays in perfect control. In place of the normal trailing edge flaps a "decelerator" in the form of a split rudder is fitted. With the decelerator open little speed is gained when nosing down after coming in over high obstructions and the drag being well above and behind the centre of gravity helps to get the tail down and adds directional stability at low speeds. An interesting type of wing construction is employed which entails the use of chrome molybdenum steel tube spars of special shape with reinforcements forged on at points of greatest stress. The negative stagger puts the highest loads on the front spars which are deeper and stronger than those at the rear. By running the flying wires through the lower wing from the landing gear to the upper front spars, the loads in the wires and in the upper front spars are reduced, the landing gear is braced and the rigging may be changed by a simple adjustment at the rear spar without loosening any wires. The wing drag truss is made of tubular steel compression members and drawn steel tie rods. Many private owners have had the unpleasant experience of discovering after the purchase of an aircraft that on the addition of night flying equipment, wireless or extra fuel tanks, they have not only spent a great deal of money, but have seriously decreased the performance of their aircraft and have cut down the baggage and passenger allowance. In the "Beechcraft" such equipment is considered an integral part of the machine from the earliest stages of the design. The standard fuel capacity is 145 gallons, which is sufficient for a cruising range of about 1,000 miles in normal conditions. This fuel load may be carried without decreasing either the number of passengers or the amount of baggage, normally carried. As the result of co-operation between the Beech Aircraft Company and the Switlik Parachute & Equipment Company, seats as comfortable as the standard type, but with parachutes built in as part of the upholstery can be furnished. While the landing gear is not retractable, in flight, the wheels drop to the fully extended position of the hydraulic shock absorbers, but may be pulled up electrically to the normal taxying position. The mechanism effecting this operation is controlled by a lever beside the throttle and is so arranged that the throttle cannot be closed below cruising speed unless the landing gear lever is moved to the down position. Concealed in the rear of the large streamline fairings over the wheels are sumps for the fuel system. The fuel flows by gravity from the tanks into the sumps and is pumped thence by an engine driven fuel pump. The front sections of the wheel fairings are easily removed for inspection and the changing of tyres. For the latter operation it is necessary to remove only two bolts. When fitted with the 420-h.p. Wright "Whirlwind" the machine is known as the model 17R. A more powerful power plant may, however, be installed, and the aircraft is then known as the model 17J. In either case the engine is enclosed in an N.A.C.A. cowling, which is in two sections. In the front section are baffles which direct the air flow to the cylinders and other points, while the rear section is hinged to give access to the engine. The latest news from the manufacturers is that they are producing a small "Beechcraft" using a Jacobs 225-h.p. engine. The top speed is 175 m.p.h., cruising speed 155 m.p.h., and landing speed 45 m.p.h. This type is fitted with a retractable undercarriage. The original "Beechcraft" has completed a tour of America, during which it travelled approximately 25,000 miles at temperatures from 20 deg. below zero to the heat of the southern desert regions, and in every respect behaved admirably. Top speed 200 m.p.h. 235 m.p.h. Cruising speed (87 per cent, full r.p.m.) 170 m.p.h. 200 m.p.h. Landing speed 60 m.p.h. 62 m.p.h. Rate of climb 1,500 ft./min. 2,300 ft./min. Service ceiling 20,000 ft. 27,000 ft.
Span 34 ft. 4 in. 34 ft. 4 in. Length 24 ft. 2 1/2 in. 23 ft. 11 in. Height 8 ft. 7 1/2 in. 8 ft. 7 1/2 in. Wing area 323 sq. ft. Weight (empty) 2,700 lb. 3,000 lb. Useful load 1,800 lb. 1,750 lb. Gross weight 4,500 lb. 4,750 lb. Wing loading 13-9 lb./sq. ft. 14-7 lb./sq. ft.
Power loading 10-7 lb./h.p. 7-3 lb./h.p. 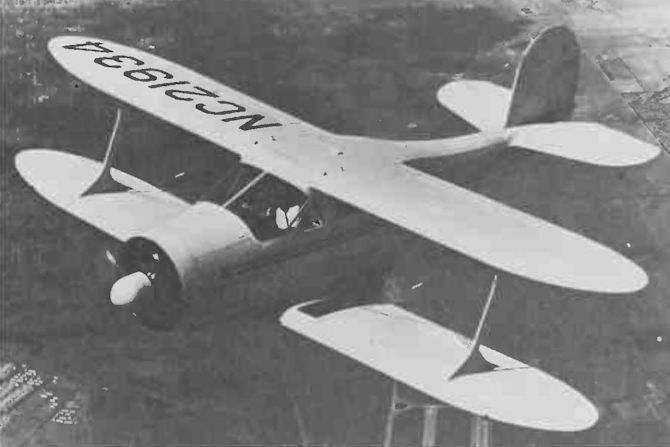 WALTER BEECH, who used to be the power behind the Travelair concern, has produced a most interesting machine in his "Beechcraft" (Flight, May 17, 1934). Though carrying four people in a comfortable cabin, it has a better performance for only 225 h.p. (Jacobs engine) than the machines of other American designers. The model we flew recently has been brought to Europe by Mr. W. Faust and Mr. H. J. White, of the Socony-Vacuum Oil Co., Inc., and it impressed us most favourably. It has not the lateral or longitudinal stability of most American aeroplanes, in fact it is almost neutral on these axes, but its manoeuvrability is excellent. Directionally it is perfectly stable although the rudder is heavier to operate than the ailerons or elevators. With a cruising speed of 150 m.p.h. the outlook is very important, but we did not find the extreme slope of the one-piece curved safety-glass windscreen detrimental at all. Even when flying at night there was no reflection except when the dashboard was too brightly lighted. Once the machine is flying, the pilot has a very wide field of view, but the nose is too large for comfort when taxying. The undercarriage folds up quickly, inwards into the middle of the fuselage beneath the cabin floor, being operated by compressed air from the Heywood engine starter system. When lowered it steepens the glide and slows up the machine, but flaps, controlled by a hand lever, and hinged to the rear bottom spar, are also fitted so that landings can be made in confined areas. Being a biplane and having a pronounced back-stagger, the "Beechcraft" looks unusual for an American machine, but this arrangement certainly results in an excellent view for the pilot and his passengers and an uncommonly high performance. THE aerodynamic and structural efficiency of the American Beechcraft Model B-17-L (probably the best-selling Beechcraft type) can be conveniently expressed as: Four seats, 225 h.p., cruising speed 152 m.p.h. It is probably the most unorthodox machine on the market so far as lay-out is concerned and might appear to the uninitiated to be a real "handful" in the air. Actually it is quite docile and is in wide, every-day employment. A flying trial by Flight some time ago revealed less lateral and longitudinal stability than is found in most American machines, but excellent manoeuvrability, as might be expected from the compact biplane arrangement. The wide undercarriage retracts quickly into a space beneath the cabin floor, being actuated by compressed air from the Heywood starter system. The drag of the lowered undercarriage in conjunction with the split flaps confer a steep gliding angle and a normal landing speed. Comfort and good outlook are further qualities. Structurally the machine exhibits few abnormal features; the wing framework is of wood and the fuselage of steel tubing. In this country the agent is Mrs. Amy Mollison, who keeps a demonstration machine, mounting a Wright Whirlwind engine, at Croydon. There are various other attractive Beechcraft "lines," including the B-17-R (420 h.p. Wright; maximum speed 201 m.p.h.) and the A-17-R (700 h.p. Wright; maximum speed 250 m.p.h.). The main data applying to the B-17-L are: Weight empty, 1,600 lb. ; disposable load, 1,550 lb. ; span, 32ft. ; length, 24ft. 5in. ; maximum speed, 175 m.p.h. ; landing speed, 45 m.p.h. Этот восстановленный самолет Model 17 сфотографирован в 1985 году с канадскими опознавательными знаками. Самолет окрашен в цвета компании "Beech". Beech E.17B N48974, owned by James C Spriggs of Aguila, AZ. 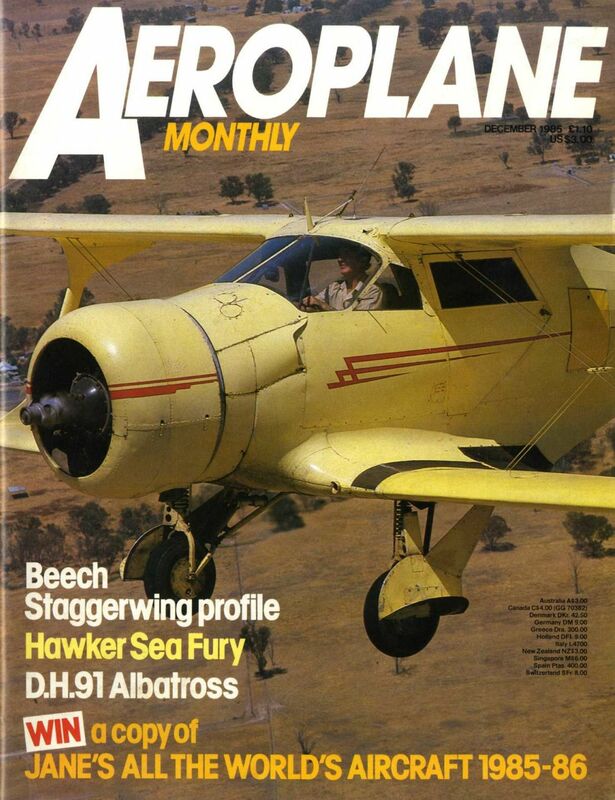 Beech 17 Staggerwing - один из самых красивых легких самолетов, выпускавшихся в США. Самолет имел хорошие летные характеристики и пользовался популярностью у богатых клиентов. Отличительной особенностью Model 17 было выдвинутое вперед нижнее крыло. На снимке представлен самолет Model D17S. The Beech 'Staggerwing' on the unfortunate Snow Cruiser of the 1939 expedition. 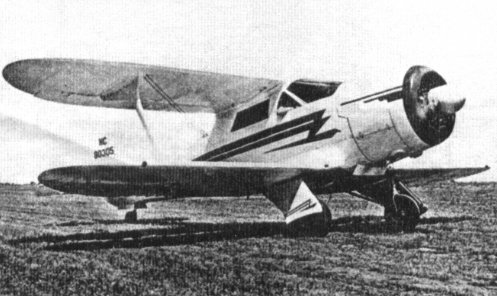 THE "BEECHCRAFT": A later and smaller version than that shown is fitted with a retractable undercarriage. A DISTINCTIVE AMERICAN ENTRY: The Beechcraft A.17F entered by Miss Louise Thaden. It is fitted with a 690 h.p. Wright "Cyclone" engine, and, as will be seen, considerable attention has been given to the streamlining. 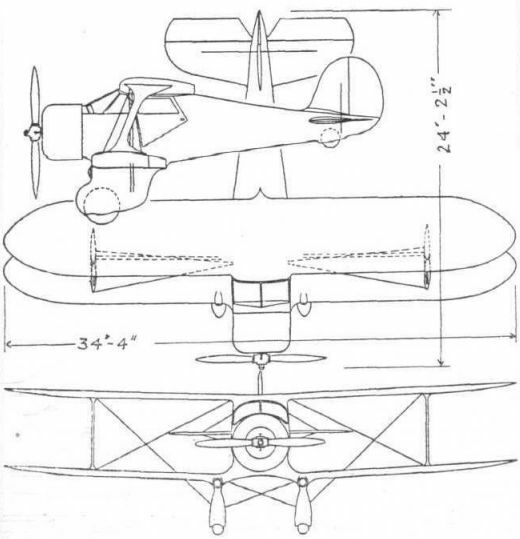 The top plane has a big backward stagger, although this is not very apparent in our illustration. 4 ноября 1932г. : поднялся в воздух классический легкий самолет Beech Model 17 Staggerwing, развивавший скорость 322 км/час и выпускавшийся до 1948 года. Showing interest in the Beechcraft at Reading. HIGH-SPEED LUXURY: The latest Beechcraft photographed last Saturday at Lympne whither it was brought by Mr. James Haislip, the European representative. This machine, the C.17.R, is powered with a 420 h.p. Wright Whirlwind (which gives it a maximum speed of 210 m.p.h. at 12,000 feet) and was brought over, appropriately enough, by airship from the States. Surrey Flying Services are the Beech agents for the United Kingdom and Ireland. The Beechcraft D17R Four-seat Cabin Biplane (450 h.p. Wright engine). Known as the "Flying Back Stagger" the Beechcraft D17 is still in use in various parts of the world as a cabin 4-5-seater. Illustrated is CF-EKA at Montreal Airport. A beautifully finished, dark blue and white trim, 1946-built, four-seat Beech Model D17S, with the distinctive back-staggered wings and "racy" sloped windshield. Note the unusual ventral radome-like fitting aft of the wings. HIGH SPEED COMFORT. The new Beechcraft in which Mr. W. Faust, Director of Aviation Sales, and Mr. H. White, Aviation Sales Manager, of the Socony-Vacuum Oil Co., Inc., will shortly be touring Europe. With a retractable undercarriage this four-seater has a top speed of 170 m.p.h. It has a 225 h.p. Jacobs engine. Flaps reduce the landing speed to 45 m.p.h. 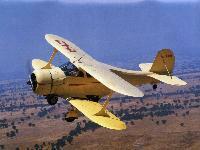 The Beechcraft F17D Four/five-seat Cabin Biplane (330 h.p. Jacobs engine). Самолет, на котором доставлялось оружие повстанцам Фиделя Кастро: "Бичкрафт" D-17S. The Beechcraft GB-2 Traveller Light Transport Biplane (Pratt & Whitney R-985 engine). 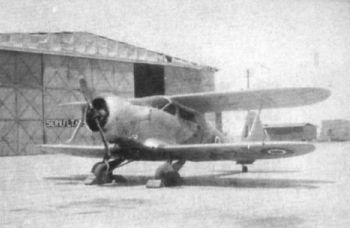 Beech Traveller I FZ43S, probably photographed at Khartoum, was one of a batch of 12 delivered to the Royal Navy under lend-lease from October 1943. The Traveller was a five-seat communications aircraft powered by a 450 h.p. Pratt & Whitney Wasp junior radial engine.